Somehow, World War Two has unintentionally become a theme this summer: after The Guernsey Literary and Potato Peel Pie Society and The Novel in the Viola, I found myself reading Goodbye to Berlin by Christopher Isherwood. I had long been familiar with Christopher Isherwood’s name through my research on Rosamond Lehmann, with whose family he was very close at one time, but I had never yet got around to reading any of his work. Then, about a month and a half ago, all of a sudden it seemed that his name was all around me: my father bought the 2009 adaptation of A Single Man, starring Colin Firth, and only a few days later, my closest friend wrote to ask me if I’d heard of the BBC dramatisation of Christopher and his Kind. I had just bought Goodbye to Berlin (finally!) and couldn’t help laughing at the coincidence. In his late twenties, Isherwood left England and his upper middle-class background and moved to Berlin, attracted by the city’s cultural life and reputation for sexual freedom. Many of his friends at the time had settled in Germany and Austria: with him in Berlin were W. H. Auden and Stephen Spender, while John Lehmann (to whom Goodbye to Berlin is dedicated, and who wrote about his own experience of Nazi Austria in his autobiography The Whispering Gallery) visited frequently from Vienna. Spanning the years 1930-1933, Goodbye to Berlin is a fictionalised memoir of Isherwood’s stay in Berlin, where he earned a precarious living teaching English and witnessed at first hand Hitler’s rise to power. Isherwood insists in his 1935 foreword that the book is a work of fiction and therefore not to be taken as a literal account of his years in Berlin. However, while the characters and their stories may indeed be products of his imagination, the city and the political climate in which they take place are quite obviously not. The lines between novel and autobiography are further blurred by his use of a first-person narrator who bears his own name. With the consummate flair of the story-teller, Isherwood weaves together and dramatizes his observations of life in nineteen-thirties Berlin, capturing the spirit of the city with great liveliness and wit. And apparently without judgment: in the opening paragraphs, the narrator tellingly compares himself to a camera passively and without thought recording everything around him. One senses that Isherwood is wary of novels written to fit an ideological agenda. There is nothing of the political manifesto about Goodbye to Berlin – no moral diatribes, no discussion of the pros and cons of Nazism, and certainly no telling the reader what to think. But subtly, through the stories he chooses to tell and through his narrator’s reactions, he nevertheless makes his opinions known. The book is made up of six sections which chronicle the evolution of the German mentality towards Nazism. “A Berlin Diary (Autumn 1930)”, focuses on daily life in the flat Isherwood shares with a rather shady collection of people: there is his landlady, the fat and middle-aged Fraulein Schroeder, who cannot wrap her tongue around his English name and comically persists in calling him Herr Issyvoo; pretty, silly Fraulein Kost, who entertains gentlemen callers for a living; Bobby, who mixes drinks in a seedy bar; and Fraulein Mayr, whose bull-dog jaw and Nazi convictions excite Isherwood’s antipathy. As he makes his way to and from lessons, he describes their conversations, their affairs, and their quarrels with a sharp and humorous eye. 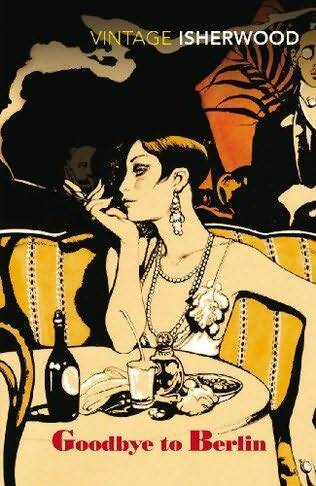 The second section of the book revolves around the character of the English upper-class expatriate Sally Bowles (who later provided the inspiration for the musical “Cabaret”). Nineteen and barely out of the school-room, Sally manages to combine the naiveté of extreme youth with the ennui of the jaded demimondaine, to hilarious effect. Affected (“Oh darling, how utterly marvellous!”) and immoral, she wears emerald green nail polish and black silk, drinks cocktails for breakfast, and has touching faith in the idea that if she sleeps with every man she meets, she will one day come across a wealthy patron who will turn her into the Hollywood movie star she dreams of becoming. Isherwood then takes us to Ruegen Island, where he spends the summer of 1931 writing and makes the acquaintance of Peter, a neurotic Englishman, and his much younger lover, Otto. Otto is another of the memorable characters in Goodbye to Berlin: like Sally, he is out for what he can get, and callously takes advantage of Peter’s affection for him. When the fun runs out, Otto casually makes off with the contents of Peter’s wallet, without a backward glance or a word of farewell. However, his childish insouciance and mischievous antics make it difficult to dislike him completely. When Isherwood falls on hard times and can no longer afford Fraulein Schroeder’s rent, he doesn’t hesitate very long before accepting Otto’s offer of moving in with him and his family. Life in the chaotic Nowak household gives him an unprecedented glimpse of the appalling poverty and squalor of the Berlin slums. In vivid contrast to the depiction of the Nowaks is Isherwood’s portrait of the Landauers, a wealthy Jewish family whose only daughter Natalia is one of his students. Friendly and generous, the Landauers overwhelm Isherwood with gifts of fresh fruit, concert tickets, and embarrassing questions about his writing. Later on, Isherwood is befriended by Natalia’s cousin Bernhard, a secretive, effete man who includes him in his world of garden parties and luxurious country house weekends, even as his cynical outlook and sarcastic manner frequently cause his guest acute discomfort. Bernhard’s resignation to the knowledge that he is part of a world which is destined to disappear makes him the most tragic figure in the book. For in the last section of the book, “A Berlin Diary (Winter 1932-3)”, violence escalates as riots break out, Nazis march through the streets smashing shop fronts and beating up those who get in their way, and schoolboys get arrested along with seasoned activists. The title, which echoes that of the opening section, thus providing symmetry and indicating that the cycle of stories is drawing to a close, also has another, more sombre, connotation: Isherwood’s choice of season clearly shows his awareness that Hitler-run Germany has entered a new and darker era. The Berlin he came in search of – cosmopolitan, decadent, alternately glamorous and sleazy, and endlessly entertaining – is all but gone and it is time to go home. This entry was posted in Book Reviews, Fiction and tagged 1930s, antisemitism, Berlin, Christopher Isherwood, John Lehmann, rise of nazism, Rosamond Lehmann, Sally Bowles. Bookmark the permalink. I’ve never really had an interest in this time period in Germany, but this sounds fascinating. I like that Isherwood doesn’t pass judgement, but allows the reader to come to their own conclusions about what’s going on. Thanks for the great review! To be perfectly honest, I’ve never been that attracted to any period in Germany 🙂 But Isherwood is a wonderful writer: his prose is spare – no Proustian descriptions there! – but in a few deft brush-strokes he sets a decor and an ambiance. And despite the serious nature of his subject-matter, there is a great deal of humour! It’s easy to read and very enjoyable (Nazis excepted, of course) and I’m definitely going to add more of his books to my reading list. I’d say strong similarities to your style there. Really am looking forward to seeing this book of yours. “in a few deft brush-strokes he sets a decor and an ambiance” – out of everything written in the post, this phrase sticks in my head. I really like it. Thanks! !